You are here: Home » Salmon, veggies, and salad…oh my! Salmon, veggies, and salad…oh my! Preheat your oven (or toaster oven) to 400 degrees. Put 2 small pots of water on to boil for the broccoli and asparagus. 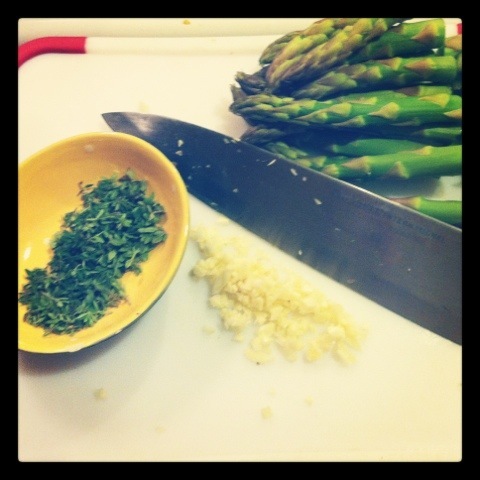 Cut off the bottom portion of the stems of asparagus (usually 2-3 inches) and cut the broccoli into florets. The salmon will only take about 10 minutes to cook so you want to wait to do that last. In the meantime, drop the broccoli in the boiling water and keep an eye on it. Once it’s at your desired tenderness dump it into a colander and either put it in an ice bath or just run some cold water over it to prevent it from continuing to cook. Once the water for the asparagus is boiling, throw those in. If you need to cut them in half to fit them in the pot, then do it! You might want to throw the stems in first if they’re a lot thicker than the tops. Put a few pads of butter in your baking dish and the thyme leaves and stick it in your preheated oven. Keep an eye on it! Don’t burn the butter! Once it’s melted, salt and pepper your salmon fillets and place them in the baking dish and put them in the oven. Once your asparagus are done, stick a tab of butter and some grated parmigiano cheese if you’d like. Cheese makes everything better! Now those are done. 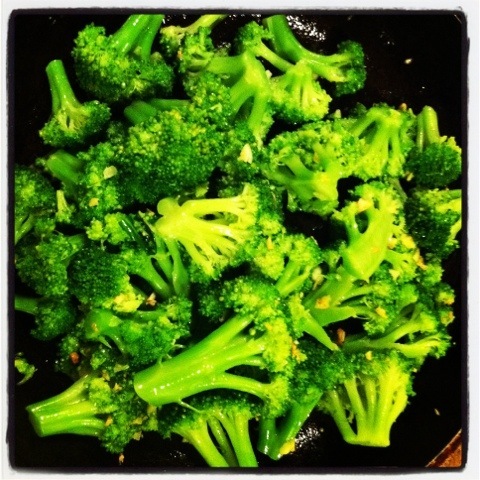 Back to the broccoli, heat up a pan with some olive oil and cook your garlic for a few minutes, being careful not to burn it. Throw in your broccoli florets and let everything sautee for a few minutes. If it looks a little dry then just add some more olive oil. Check on your salmon, flip it over, and after a few minutes check it with a fork to see if it’s done. It should be flaky. Plate everything and enjoy! This isn’t one of my best meals–buuuut it’s quick and healthy! ← Oh you fancy, huh? Nah, not really…. I’m going to try this meal, salmon is my favorite..